Inside a busy acute care hospital, it’s not uncommon for several hours to pass between the moment a patient is cleared for a procedure and the moment that procedure occurs. When Tom Parker* arrived at the hospital with abdominal pain and a pre-existing kidney condition, before doctors could diagnose and treat him, they needed to know that his body could tolerate the kidney-sensitive contrast agent needed to perform a CT scan which would allow them to see inside his body. A thorough evaluation and blood work revealed Tom’s kidneys could withstand the contrast needed for the scan. However, between the time the CT was ordered, and Tom was to begin prepping for the exam, his condition and kidney function had seriously deteriorated. If administered, the contrast injection could have caused kidney failure, a discovery not made by the doctor or nurse, but flagged by artificial intelligence (AI). AI helped detect Tom’s kidney condition, flagged it to staff, who subsequently called off the scan that could have put him into kidney failure. 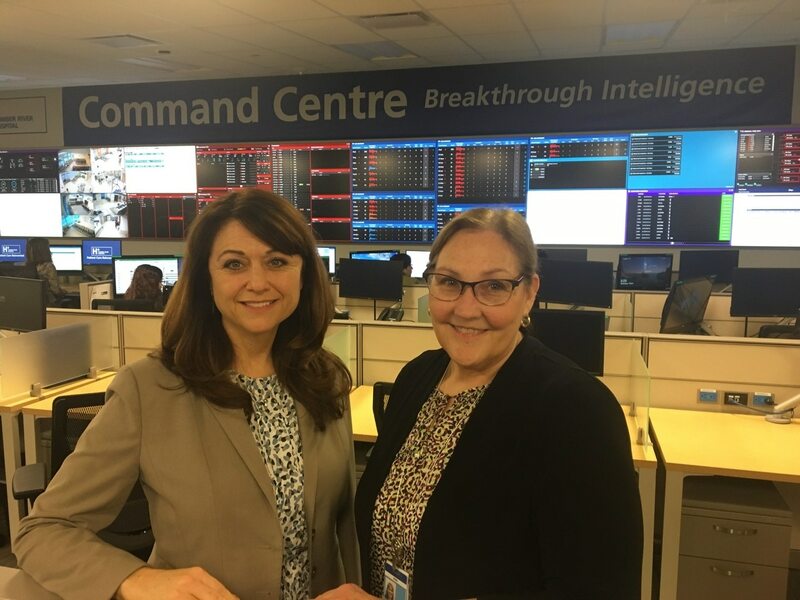 Debbie Harkins and Ann Cole are part of the GE Healthcare team who developed the AI, or what they call “tiles”, that pull data from a variety of sources to feed information to GE Healthcare’s mission control-style command centers. At the heart of the command center lies a centrally located hub that houses a Wall of Analytics (WOA), displayed on a bank of monitors in the center and accessible on mobile devices. The WOA processes real-time data from multiple sources across the hospital and triggers staff to act. Debbie, a practicing nurse, brings an MBA and more than 25 years of practical healthcare expertise to the GE Healthcare team, a combination of skills that helps her recommend the roles and responsibilities of the staff that works inside the Command Center along with the actions needed to come out of the data to affect change. “The reason the Command Center is successful is the analytics, but it’s enhanced when the right people are in the room working as one team. It’s critical to have people accountable for driving actions as an output of the analytics,” said Debbie. Both women agree that one of the biggest challenges when building the Command Center was data integration. “You’re trying to meld a variety of source systems into one,” said Debbie. After figuring out how to get the systems integrated, the team then turned their efforts to the people. “Data is data; it doesn’t lie. What was hard was to get people to look at the data in a different way,” commented Ann. “Change management is a big focus for the team when collaborating with the teams,” according to Debbie. *Tom Parker’s name was changed to protect the identity of the patient.